Showy flower spikes topping tall stems make red ginger flower a favorite in tropical climates. In fact, you'll see it growing everywhere in Hawaii. But did you know that you can grow this spectacular beauty indoors? Red ginger plants grow wonderfully in containers. Standard varieties will soar to 6 ft (1.8 m) or more. For containers, you'll want a dwarf variety, such as 'Red Dwarf' that reaches only about 3 ft (90 cm) tall with lush, compact foliage. Poking up between the red bracts, the true flowers are small, tubular and white. Give your plant plenty of light to make this tropical beauty bloom. 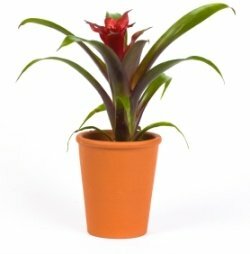 Flowering ginger makes an ideal potted plant for the sunroom, warm greenhouse or any brightly lit room. Its large leaves and bold color make a dramatic statement in any room. Repot in spring only to replace with fresh soil. 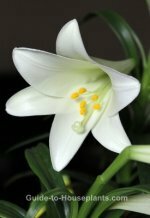 This flowering plant blooms best when pot-bound, so keep the rhizome roots crowded in the container. Use a pot with drainage holes to prevent soggy soil. Overwinter A. purpurata in a sunny window. Cut back on watering, but don't allow the soil to dry out. Stop fertilizing after flowering is over. In early spring, resume normal care. 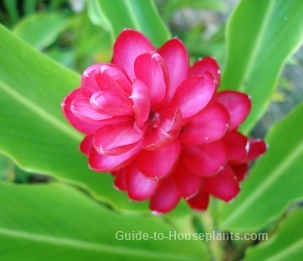 You may have difficulty finding Alpinia purpurata for sale in garden centers. Unless you live in Hawaii or south Florida, your best bet is to check some online nurseries. Look for a dwarf variety for growing in a container. Light: Ginger flowers thrive in bright locations with some direct sun. Red ginger makes a stunning floor plant in front of a sunny window. Turn the pot each week to give each side equal light exposure. Water: Water generously throughout the growing season, keeping the soil evenly moist. Water sparingly after flowering is finished. Yellow leaves are usually a sign of overwatering. Temperature: Average room temperatures 60-75°F/16-24°C. If you scoot your container to the patio or porch for the summer, don't worry -- it can take the heat. But bring it back indoors when the temperature drops...these tender perennials will only tolerate temps as low as 50°F/10°C. Fertilizer: Feed monthly in spring and summer with a high-potassium liquid fertilizer diluted by half. Propagation: Pot rhizomes in spring for summer bloom.